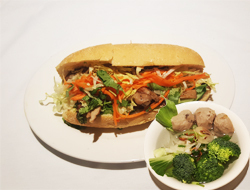 All sandwiches are served with choice of Cup Wonton, Meatballs or Hot & Sour Soup. 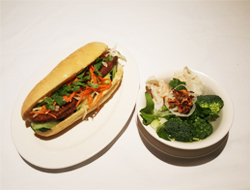 Served with Mayonnaise, marinated Carrot, Cucumber, Salad on fresh crusty French roll. 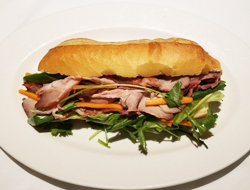 Pastrami beef and turkey, prosciutto, green onion, mayonnaise, marinated Carrot, Cucumber, Salad on fresh crusty French roll. 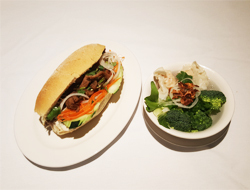 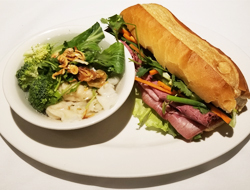 Vegetarian patty with marinated carrot, cucumber, peanut sauce, cilantro on fresh French rolls, with choice Cup of Wonton or Hot & Sour Soup.